BLOOMINGDALE-Jefferson County Joint Vocational School student Cody Waggoner proved his mettle by capturing third place during a recent welding contest. Waggoner, a junior in the welding program, attended the Mid-East Career and Technical Centers’ 15th Annual Weld-Off Contest hosted by the Plumbers and Pipefitters Local 495 in Cambridge. He was among 18 contenders and completed performance-based tests to showcase his hands-on skills. Todd Parker, JVS welding instructor, said Waggoner had to pass a D.15 certification test before he could move on. That required performing two vertical and overhead position exams and his work had to undergo a visual inspection by a judge. Parker noted that that JVS students have attended the competition for the past 15 years with first-place winners named during the last two events. “I’m proud of Cody,” he added, saying that Waggoner gained certification recognized by the State of Ohio which gives him an advantage when he enters the workforce. Waggoner, a Toronto-area resident and student at Edison High School, was also surprised by his honor and said it was his first time to participate. He added that he has gained some great experience at JCJVS and enjoys the hands-on training he’s received. 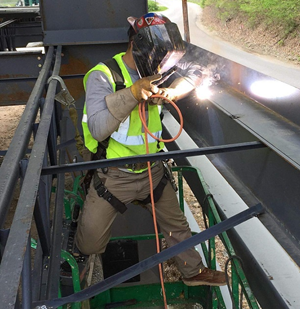 Waggoner plans to pursue a career as a welder or ironworker upon graduation. BLOOMINGDALE-Three students in the multimedia and design program at Jefferson County Joint Vocational School gained recognition after participating in MAD Fest 2019 at West Liberty University. Junior Therman Gross and seniors Chris Morale and Corbyn Behrendt were among students from 16 high schools in West Virginia, Pennsylvania and Ohio who attended the media, art and design festival on April 12 in the College Hall auditorium, where they also got to network with creative peers, attend workshops and meet industry and education professionals. JVS Instructor Cody LaRue said it was the first time his class took part and he was proud of the honorees’ achievements. Students were asked to submit original projects in various mediums, from the traditional such as painting and sculpture to the more modern mixed media and digital imaging. LaRue added that the projects were completed in class and his pupils incorporated the skills they learned through the program. The works were judged by guest jurors Reagan Heller, vice president of Art with Schell Games; Chris Russell, founder and executive director of PopShopWV; and Brandon Jennings, graphic designer with KBK Enterprises, and an awards ceremony followed the event. Gross, a student at Indian Creek High School, earned first place in graphic design for “Let’s Start a Riot,” a piece which used imagery and typography in a double-exposure format; Morale, who hails from Edison High School, placed second in the same category with his “Batman” rendering which superimposes the caped crusader with the Gotham City skyline; and Behrendt, who attends Toronto High School, received honorable mention in animation with her work, “Bury a Friend,” which incorporates kinetic typography animation. Morale added that he was surprised to gain recognition, while his education at JCJVS will enable him to carve a successful path for his future. He plans to continue in the field and study videogame design. Behrendt echoed those remarks, saying she was thrilled to earn accolades. “I didn’t expect it,” she added, noting that she also plans to further her education in graphic design. Photo Cutline: Multimedia and design students at Jefferson County Joint Vocational School fared well during MAD Fest 2019 at West Liberty University. The students attended for the first time and earned recognition for their entries in graphic arts and animation. Pictured are, from left, Corbyn Behrendt, honorable mention for animation; Chris Morale, second place for graphic arts; and Therman Gross, first place for graphic arts. BLOOMINGDALE-They’re going to Disney World! Junior health technologies students Azrielle Pratko and Sam Shrock will represent Jefferson County Joint Vocational School this June when they head to Orlando, Fla., for the Health Occupations Students of America (HOSA) 42nd Annual International Leadership Conference. There they will join about 10,000 students from 47 states and Puerto Rico for a series of competitions and conference events. Pratko, who hails from Indian Creek High School, and Shrock, who attends Edison High School, were part of the CPR/First Aid team and squared off against 18 other teams from across Ohio during the state HOSA competition at the Columbus Convention Center on April 9-10. They first had to complete a written knowledge test and the top 10 teams went on to perform hands-on skills tests, with Pratko focusing on CPR and Shrock showcasing his knowledge of first aid. They were among the top three teams selected to advance to the national event on June 19-22. Both were excited to move on, but for various reasons. “It’s two of my biggest dreams come true: to fly and go to Florida,” Shrock added. Both said their interest in the health field was sparked by medical issues that hit close to home and they now plan to pursue careers in that sector. Pratko is eying a future in pharmacology and may serve the in the military as a corpsman or with the Navy Reserves while Shrock said he may pursue nursing. 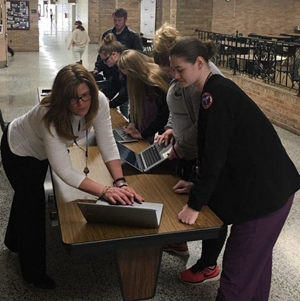 HOSA Advisor Tammy Sismondo, who also instructs the health tech program at JCJVS, was proud of the duo and said they toiled in preparation of the contest. She added that the JVS has had students attend the nationals for at least a decade and they learn a lot along the way. 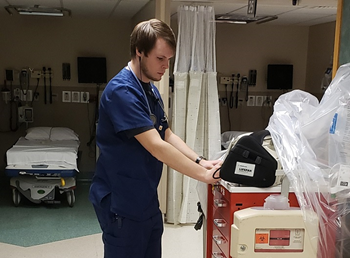 BLOOMINGDALE-The health technologies program at Jefferson County Joint Vocational School is marking another successful year after all of its seniors passed the state nurse aide exam. Instructor Tammy Sismondo said her class gained 100-percent passage rate on the test, which is provided by the Ohio Department of Health and administered at the school by D&S Diversified Technologies. The students completed the exam when officials from D&S visited the site at the end of December. Sismondo said the class had to complete a written test and hands-on clinical portion to share their knowledge, and now they are able to work in health care facilities. She commented that many of them are already gaining some on-the-job experience. She noted that pupils are participating at Trinity Medical Center and in area nursing homes and getting some real-world experience before officially joining the workforce. First-year students in the culinary arts program at Jefferson County Joint Vocational School completed their practical for creating salads in their lab, which is instructed by Glenn Zalenski. Pictured with their dishes are, from left, Sarah Fox, Sarah Rager, Daylynn Anderson, Andrew Constantini, Dashel Mumaw and Mekenna Johnikins. Senior cosmetology students Cassie Wertenberger, pictured at left, and Haelyi Eakle practice on manikins as part of their class lesson. Students learn a variety of methods from cuts and coloring to manicures and also provide salon service to the public. The program takes appointments on Tuesdays from 11:45 a.m. to 2:30 p.m. and Fridays from 11 a.m. to 2:30 p.m. and prices range from $3 for shampoos and partial cuts to at least $30 for spiral perms. For more information about enrollment or appointments, contact the JCJVS at (740) 264-5545. Carpentry students at Jefferson County Joint Vocational School add siding to the new modular home they have been constructing on the campus since the start of the school year. Carpentry and electrical trade students have been involved in creating the three-bedroom, two-bath structure—the second one built in over two years—with additional assistance from professional plumbing and HVAC contractors. Once completed, the home will eventually be sold and moved offsite. 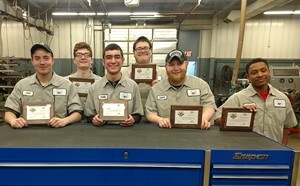 Juniors in the power mechanics program at Jefferson County Joint Vocational School passed their Briggs and Stratton Master Service Technician (MST) exam and gained certification to aid them in the field. The students had to pass six tests and also received six credential points towards graduation. Pictured are, front from left, John Hojonski, Daniel Sammut, Dakota Kernen and Malcolm Walker. Back: Seth Fitzgerald and Robert Batson. Absent from the photo is Damon Petrosino. 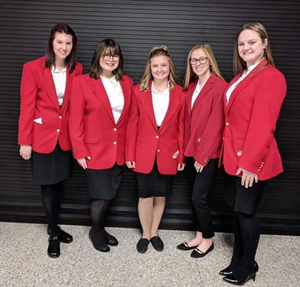 BLOOMINGDALE-Five early childhood education students at Jefferson County Joint Vocational School will head to Columbus this month to take part in the Family, Career and Community Leaders (FCCLA) State Leadership Conference. Events take place at the Ohio State Fairgrounds on April 25-26 and seniors Brooke Mitchell, Kayla Habbit and Brianna Sheets will take part in competitions while senior Emily Manley and junior Hannah Mitchell will represent the group at the conference. Brooke Mitchell will compete in the early childhood education category while Habbit will take part in curriculum unit and Sheets will participate in the job interview portion. Meanwhile, Habbit and Sheets will also compete in the lesson prep team category. It is the second time the trio has been part of the event and they are ecstatic to return. Participants submit projects to a panel of judges, who then score them based on the student’s presentation. Entrants are ranked with other competitors in that category to determine who receives a medal and the top 10 move on to the nationals. Habbit added that she and Sheets would work together on the lesson prep team and they have to provide an organized and themed project for review. Meanwhile, Manley and Hannah Mitchell will attend a series of sessions at the conference, which is attended by thousands of other FCCLA members statewide. Juniors in the criminal justice program at Jefferson County Joint Vocational School passed their state certification examination through the Ohio Peace Officer Training Commission (OPOTC) in Ridgefield and are now certified after completing the private security basic training program. The group also toured the state Bureau of Criminal Investigation (BCI) facility during their visit. Pictured are, front from left, Farashae Johnson, Paige Layman, Mackenzie Wedlake and Jenna Reed. Back: Blayke Malone, Jeremiah Morris, Bryce Gaston, Nathaniel Granatir and Faith Cook. BLOOMINGDALE-Criminal justice students at Jefferson County Joint Vocational School learned how close to home human trafficking really is and what signs to look for during a special lecture. Theresa Golden, city director of Refuge for Women Ohio Valley, a non-profit, faith-based organization that specializes in long-term care for women who escaped human trafficking and sexual exploitation. Refuge for Women offers up to 12 months of safe housing at no charge to the resident and around-the-clock therapeutic care. Golden addressed juniors and seniors about the growing issue and said Ohio is fourth in the nation in the crime’s occurrence. Men, women and children are exploited across the nation and the local organization has aided roughly 166 people alone. Golden said Refuge for Women Ohio Valley provides a three-step process to help victims heal and start anew. The program includes safety and healing, which includes trauma-informed care, as well as Bible studies; job preparation, schooling and life skills; and gaining employment. Golden added that clients are considered graduated from the program after nine months but remain in the residence for three more months while employed, then they can transition into the community and use local resources. “The community’s been great in their support,” she continued. Refuge for Women has been active in the U.S. since 2009 and the local chapter began in January. The goal is to have an organization in every state while the local site currently plans to add more safe houses that could lodge up to six women, in addition to an emergency shelter. She added 90 percent of the victims are between the ages of 12 to 14 years old and may have been traumatized by childhood abuse. They are left vulnerable by that experience and could become easy prey for traffickers. Students also watched a video about trafficking victims who escaped and are working to regain their lives. One woman in the video said her trafficker gained her trust before transporting her around the country to do his bidding. She noted that it was important to tell someone if they are in trouble and to get help. Golden also conducted a question-and-answer session with the students and said traffickers are not just online but also in local malls and other public areas. She said cases have been on the rise and since many criminal justice students could enter law enforcement, she offered advice on potential signs of exploitation including signs of physical abuse, depression and sexualized behavior. For more information about Refuge for Women Ohio Valley, go online to rfohiovalley.org or the Refuge for Women Ohio Valley Facebook page. BLOOMINGDALE-T.J. Birney is getting a jumpstart on his future by parlaying his studies into a career. Birney, a junior in the small animal science program at Jefferson County Joint Vocational School, has earned awards for showing cattle. The son of Sherri and the late Phillip Birney Jr. of Hopedale and a student at Harrison Central High School, he has busily groomed animals for county to national events and earned accolades for his efforts. Among his recent events were the Ohio Beef Expo, where he earned grand champion main Anjou heifer and 10th overall heifer; the Michigan AGR, where he earned reserve champion market heifer and reserve champion maintainer heifer; and the Holmes County Preview, where his entry won grand champion high percentage maintainer heifer. Birney also enjoys showing cattle and hogs at the county fair level. 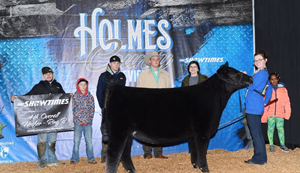 He also works with Schroeder Show Cattle, which is owned by Nick Schroeder of Columbus Grove, to prepare cattle for national level shows on weekends and has attended such events as Michigan State Beef Expo. Birney added that winners receive an array of prizes in addition to show points, the latter which are tallied at the end of the year to potentially gain even larger rewards. His primary role is to groom the animals so they look their best for competition, and that comes naturally since he spends much of his time at the JVS studying veterinary science and animal anatomy but also participates in the school program’s pet grooming service. Upon graduation, Birney plans to attend The Ohio State University ATI to study large animal science and management. For now, he prepares himself through the cattle shows and working with 500 head of Angus beef cattle on his family’s 250-acre farm in Harrison County and uses the knowledge and skills he’s gained from JCJVS. 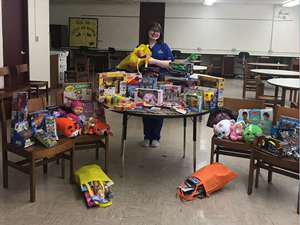 BLOOMINGDALE-Jefferson County Joint Vocational School student Brianna Sheets’ labor of love has put smiles on the faces of sick children at Akron Children’s Hospital. Sheets, a senior in the early childhood education program, led the campaign from Jan. 7 to March 1 as part of a community service project and collected items at JCJVS and her home school at Edison. She was inspired after attending a Family, Career and Community Leaders of America (FCCLA) leadership workshop in October with fellow members Brooke Mitchell, Hannah Mitchell and Sasha Mitchell. They were among an estimated 400 FCCLA students from middle and high schools statewide who heard lectures and learned how to work together in addition to being leaders. Sheets selected the hospital for her project because she plans to attend the University of Akron and study early childhood education, after which she hopes to become an intervention specialist. Over the next few months, she accepted items which met hospital criteria. The toys must be in their original packaging and must not depict violence or have loose materials, mirrors, glitter, feathers, sand, synthetic animal hair, food or fragrance. She, her FCCLA group and ECE instructor Becky Kelley delivered the items on March 22 and Sheets was pleased with the outcome. Sheets collected a total of 166 toys during the campaign and said the rewards were exceptionally sweet. “The opportunity to help Akron Children’s Hospital makes me feel very blessed to be in a position to give back,” she added, thanking everyone who advertised and contributed to the drive. “I feel gratitude. My very helpful lab teachers, Ms. Kelly and Mrs. [Deanna] Hines, helped me a lot with stepping up and becoming a leader. Without their help, I don’t believe any of this would have been possible. BLOOMINGDALE-Jefferson County Joint Vocational School will hold its biannual open house for new and prospective students on April 10. The event is set for 3:30-6:30 p.m. and coincides with the school’s parent-teacher conferences. Principal Dan Hartman said incoming juniors and other attendants can meet teachers, view classrooms and learn about any of the 15 programs including auto collision, auto service, computer networking, cosmetology, criminal justice, culinary arts, early childhood education, electrical trades, health technologies, multimedia and design, power mechanics, small animal science and welding, as well as the HVAC course eyed for the fall. In addition, refreshments will be served. Hartman expects to see the enrollment increase and said there were more than 190 applicants as of now. If that figure rises, he anticipates seeing roughly 350 juniors and seniors in the school’s classrooms and labs during the fall semester. “I want to see it go over 200 and I think we will be there,” he said. For more information, contact the JCJVS at (740) 264-5545. BLOOMINGDALE-Students at the Jefferson County Joint Vocational School have pledged to “Spread the Word to End the Word” as part of a national campaign to remove the R-word from society’s vernacular. Spread the Word to End the Word encourages people to stop using the word “retard” because advocates believe it is hurtful and dehumanizing to people with special needs. The Transition to Work program conducted an event on March 7 in observance of DD Awareness Month and had their peers sign a banner and make an online pledge as part of the initiative. Instructor Christina Henderson said a similar activity was held five years ago and her developmentally disabled students also educated schoolmates on the importance of removing the term from their lexicon since it has a negative reference. Henderson noted that it was important to inform others about the harmful impact of the word, but also to show how vital it was to include special needs people in the community. For more information about the initiative, go online to www.r-word.org. 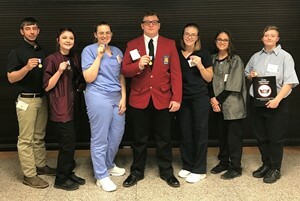 Students in the early childhood education program at Jefferson County Joint Vocational School earned medals during the Family, Career and Community Leaders of America regional competition on March 9 at the Buckeye Career Center. Among those receiving honors were, from left, Brianna Sheets, gold for job interview and silver for lesson prep team; Kayla Habbit, silver medal for prep team and silver for curriculum unit; Emily Manley, silver for language and literacy; Brooke Mitchell, gold medals for language and literacy and early childhood education; and Hannah Mitchell, silver for curriculum unit. 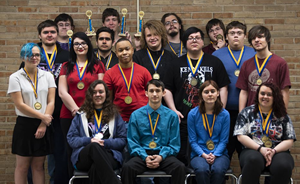 The state competition will be held on April 25-26 in Columbus. Throughout this week, the school will spread the word through announcements and activities in their academic classes. Assistant Principal Cecilia Abdalla said the event is sponsored by the Sandy Hook Promise Foundation and the goal is to raise awareness. On Tuesday, students heard an announcement from Deputy Bill Timko, school resource officer, about the country’s human trafficking epidemic. Dubbed as modern slavery, human trafficking is rampant and Ohio currently ranks fourth in the nation for the criminal act. Meanwhile, Wednesday is “Wear Green Day” to support “Say Something Week” and the site’s 318 students plus faculty and staff are encouraged to don the color for the event. English, Social Studies, math and science classes will respectively show videos and PowerPoint presentations with subsequent discussion on recognizing warning signs and reporting possible threats of violence; the roles of upstanders in history and students who have spoken up and averted tragedy; bullying; and “I’m Truly Sorry” to tell an adult and get needed help. The class activities are expected to occur on Wednesday through Friday at the teachers’ discretion. Jarvis, a licensed counselor through Trinity Health System, will hold a suicide and bullying group discussion March 4 on “Have Hope: It’s OK Not to Be OK.” Groups will meet from 9:30-10:15 a.m. and 1-1:45 p.m. and students will discuss the issues, warning signs, how bullying plays a role and what they can do to help. She concluded that anyone who wishes to remain anonymous may use the StopIT app to report issues. BLOOMINGDALE-Special needs students in Jefferson County and their families are invited to take part in Transition Night activities next month to learn how they can successfully progress in society. The event is slated for March 27 from 5-7 p.m. in the Jefferson County Joint Vocational School cafeteria and will feature agencies and resources under one roof to help students on individualized educational plans (IEP’s) as they move toward adulthood. The evening will include a brief synopsis of transition and why it is so important to begin the process way before the pupil’s senior year. Parents and students will address the group while vendors may also speak about what they do and how their services can benefit the students. Henderson hopes word will spread about the event and attract more families around the county. “The key to this event’s success is the willingness for all of the schools to share information about it with their students,” she said. “We started this event because no matter where the students go to school, it is imperative that the conversation about transition into the real world for IEP students happen at least by age 14, if not sooner. Data has proven that the sooner an effective transition plan is made for the student and the sooner it is acted upon, the more successful they will be in the real world. More agencies are expected to attend this time and returning organizations include State Support Team Region 12 (SST-12), West Virginia Northern Community College, Social Security Administration, Jeffco Services, Opportunities for Ohioans with Disabilities, Ohio Means Jobs, New Castle School of Trades, Trinity Health Systems, Ohio Center for Autism and Low Incidence (OCALI) and Parent Advocates. For more information, contact Henderson at (740) 264-5545. BLOOMINGDALE-Former students of Jefferson County Joint Vocational School are in the classrooms once again, this time as instructors teaching the newest generation of pupils. Nine graduates of the school currently hold faculty positions and lead academic and vocational programs. Russ Achhammer, Jen Davis, Diane Dalesio, Fred Jones, Soundra Mount, Todd Parker and Ron Reasoner all once walked the hallowed halls as pupils and say it is a familiar yet different world being the head of the class. Achhammer studied at the school from 1982-85 in the auto collision program, the same one he leads today. He said he had a passion for cars and the JVS fit the bill. The Wintersville High School grad fondly recalled the good times and friends among his fondest memories and said he enjoys being back in his current capacity. Booth, who studied auto mechanics from 1989-91, said he always enjoyed anything automotive and wanted to learn as much as possible. These days, he shares his knowledge while assisting auto services technology teacher and fellow JVS alum Ron Reasoner. Booth, who was a student at Edison High School, also imparts wisdom about having the patience to do a job correctly. Dalesio studied at the school from 1975-77 and said it only offered a junior program when it first opened. She found her footing in the cosmetology program—the same one she oversees today as a junior class instructor—and said it helped to determine her future career. Now that she is teaching at the school, tries to incorporate what she learned as a one-time pupil into her program today. Davis, who is an English teacher, studied business data accounting at the school from 1991-93 while attending Edison. Her former teacher was Cecilia Abdalla, currently assistant principal at the site and Davis recounted how the hands-on education definitely made a difference. Freeman, who instructs the criminal justice program, got her footing in the diversified health occupations lab—now known as health technologies-- in 1993-95. She had then attended Buckeye Local High School and had her sights set upon becoming a nurse, noting the JVS gave her a head start. Jones followed his path from a power mechanics student to its teacher today. The former Edison High School student was at the JVS from 1993-95. He decided to attend because he always enjoyed working on equipment and building things, and the school provided such an outlet. He counted the friendships he made with classmates among his fondest memories, saying they still remained intact because of their mutual interests. Jones also loves teaching at his old stomping grounds, saying he always stayed connected to the power mechanics program since he graduated more than 20 years ago. Mount, who attended the cosmetology class from 1977-79, is the senior instructor today. She recalled the school was only open for two years when she became a student while attending WHS, and she was excited to apply for the program because of her keen interest in hair and makeup and hopes to become a cosmetologist. Parker, who attended Jefferson Union High School (now Edison), was in the JVS welding program from 1985-87 but said it was not his first choice. He initially planned to study machine trades, but a lack of participants led to it being closed and he moved on welding. His teacher, Roger Hilty, eventually became his colleague but was also a major influence and mentor in his life. They worked together until Hilty retired two years ago. Reasoner, who graduated from the JVS in 1991, was an AST student from Edison South High School. He noted that his fascination with mechanics led to his choice. “As time went by, my interest evolved towards automobiles, and when I had the opportunity to attend the JVS it was an easy decision what I wanted to do,” he said, adding that his instructor was welcoming and he made friends quickly, making his transition from a traditional school much easier. He earned a certificate of completion in two years, attending the Vale Technical Institute and was employed at a local Oldsmobile car dealership when he was contacted by a former teacher about joining an auto service advisory committee. That ultimately led to becoming a substitute teacher and then he returned on a full-time basis. BLOOMINGDALE-The Crestview Inn Restaurant is back serving tasty meals to the school and public at Jefferson County Joint Vocational School. The student-run eatery opened its doors Feb. 26 at the school along 1509 County Highway 22A in Bloomingdale and runs on Tuesday to Thursday from 9 a.m. to 1:30 p.m. Breakfast and lunch items are available and instructor Glenn Zalenski said some new dishes will be on the menu. The program’s 10 juniors and seniors will oversee operations of the facility, handling service, cooking and management with Zalenski’s guidance and patrons may purchase a variety of dishes that showcases the students’ culinary skills. Traditional breakfast foods are available while lunch ranges from sandwiches and entrees to appetizers, soups, salads, side dishes and desserts. He noted that more pastries will also be offered later in the season and students are expanding their cooking capabilities with new sauces. The restaurant is available to reserve small breakfast and lunch meetings and parties while internet service is provided. For more information, contact the restaurant at (740) 264-5545, Ext. 602. BLOOMINGDALE-Twenty-four Jefferson County Joint Vocational School students will be heading to the state SkillsUSA competition this spring following success in recent contests. Eight students competed at the SkillsUSA Regional Competition at Buckeye Career Center on Feb. 23, where they earned first through third place in their events. Among those competing were welding student Dalton Sindeldecker, who earned first in welding; cosmetology student Catalina Mazzaferro, who was second in job skill demo A; criminal justice student Cheyanne Bryan, who gained third in first aid/CPR; electrical trades student Nathan Zink, who was first in job interview; health technologies student Kloe Olivo, who earned first in nurse assisting; cosmetology student Aine O’Neil, who placed third in cosmetology; auto collision student Emily Bickerstaff, who was first in collision repair technology; and carpentry Aidan Sammut, who was third in carpentry. Students who took part in the school’s Spotlight on Skills event in January directly advanced to the state competition. They include health technologies student Brook Edwards, basic health care; health tech student Kylie Law, medical assisting; health tech student Jack Reese, health occupations portfolio; health teach student Kaleb Briganti, occupational health and safety; health tech student Cassy Reed, occupational health and safety; health tech student Honesti Blair, occupational health and safety; health tech student Hannah Armstrong, occupational health and safety; culinary arts student Damar Jackson, culinary; culinary arts student Daylynn Anderson, restaurant service; and computer networking technology student Brandon Stokley, telecommunications cabling. Small animal science student Michael Banovsky will participate as a state officer while AST student Donte Grinstead and health tech student Allyson Burkett will take part as regional officers. The state competition will take place on April 16-17 at the Greater Columbus Convention Center. Several multimedia and design students at the Jefferson County Joint Vocational School advanced to the state competition after taking part in the regional Business Professionals of America contest on Jan. 23. William Lewis and Judge Hall respectively finished first in computer modeling and extemporaneous speech and Mike Maguschak was second in digital media production, and now they will head to the BPA State Leadership Conference in Columbus on March 14. Pictured are all of the school’s BPA participants including, front from left, Hunter Sox, sixth place for graphic design promotion; Lane Adkins, sixth for interview skills; Sierra Beckett, third for video production team; and Misty Davis, third for video production team. Second row: Jasmine Birtel, fifth for interview skills; Carlie Marcum, third for video production team; Robert Zimmerman, third for broadcast news production team; Michael Gregg, third for website design team; and Tyler Mitchell, third for website design team. Third row: Chris Morale, fifth for graphic design promotion; JonPaul Lavoie, second for extemporaneous speech and third for broadcast news production team; Therman Gross, eighth for graphic design promotion; and Donovan Simeral, third for website design team. Back: Lewis; Hall; Maguschak; and Ryan Morale, second for presentation management. Not pictured are Corbyn Behrendt, third for video production team and Mara Burress, second for prepared speech and third for broadcast news production team. The event is slated for March 27 from 5-7 p.m. in the Jefferson County Joint Vocational School cafeteria and will feature agencies and resources under one roof to help students on individualized educational plans (IEPs) as they move toward adulthood. 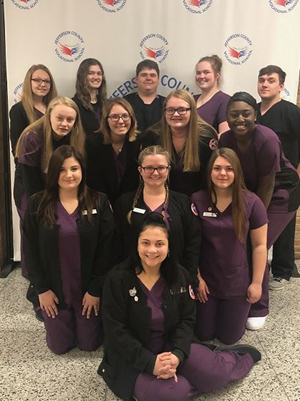 Health technologies students at Jefferson County Joint Vocational School scored well during the regional Health Occupations Students of America (HOSA) contest in Canton on Feb. 2. Those who placed within the top three now advance to the state competition in Columbus this spring. Pictured are, front from left, Alexis Cronin, who was third in medical assisting, and Izzie Pratko, who was first in CPR/First Aid. Back: Sam Shrock, first in CPR/First Aid; Kloe Olivio, third in nurse assisting; and Leah Pennington and Zanea Vanhorn, first for EMT. BLOOMINGDALE-Jefferson County Joint Vocational School students tested their knowledge during the Spotlight on Skills competition in January. Students in both academics and lab programs participated in events throughout the day on Jan. 24 that were judged by community business members, while each school program with a student organization had pupils compete for a chance to attend regional competitions. Among the latter were SkillsUSA, which includes about 80 percent of the students; the Health Occupations Students of America (HOSA); Future Career and Community Leaders of America (FCCLA); Business Professionals of America (BPA); and the Future Farmers of America (FFA). Officials said the technical trade skills portion focused on hands-on knowledge and the leadership segment reviewed softer skills from CPR/First Aid to job interviews. --Lance McAfoose, Frank Perrino and Brock Sanders (Team 2), first, and Seth Hanlin, Jack Nutter and Austin White (Team 1), second, welding fabrication team. BPA students attended their regional contest on Jan. 23, where William Lewis and Judge Hall respectively finished first in computer modeling and extemporaneous speech and Mike Maguschak was second in digital media production. They now advance to the state competition in Columbus March 14-15. Other participants included Chris Morale, Hunter Sox and Therman Gross, who respectively finished fifth, sixth, and eighth in graphic design promotion; Sierra Beckett, Corbyn Behrendt, Misty Davis and Carlie Marcum, who were third in the video production team category; Michael Gregg, Tyler Mitchell and Donovan Simeral, who were third for web site design team; Mara Burress, Jon-Paul Lavoie and Robert Zimmerman, who were third for broadcast news production team; Jasmine Birtel, who was second with Lane Adkins at third in interview skills; Jon-Paul Lavoie, who was second with Logan Schrader at seventh in extemporaneous speech; and Mara Burress, who placed second in prepared speech and Ryan Morale, who was second in presentation management individual. First-place students in the HOSA organization traveled to New Canton South High School on Feb. 2 and Sam Shrock and Izzie Pratko took first for CPR/First Aid; Zanea Vanhorn and Leah Pennington placed first for EMT; Alexis Cronin was third in medical assisting; and Kloe Olivio placed third in nurse assisting. 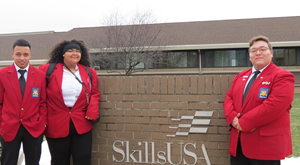 SkillsUSA students will head to their regional competition on Feb. 23 at the Buckeye Career Center in New Philadelphia and FCCLA and FFA students will advance to competitions around March and April. 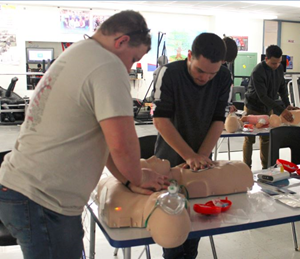 Electrical students at Jefferson County Joint Vocational School learned life-saving skills with early childhood education instructor and EMT Becky Kelley to earn their CPR/First Aid certification through the American Heart Association plus credentials toward graduation. Junior Josh Gaumer is pictured wrapping the arm of senior James Strachan during the training session. 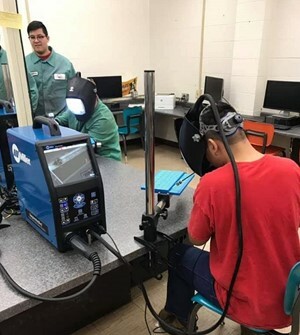 BLOOMINGDALE-The welding program at Jefferson County Joint Vocational School has gone futuristic by adding augmented reality equipment to mimic working with actual tools. Instructor Todd Parker said the Miller AugmentedArc technology was added in December and his 38 students are getting some practice for real work in the lab. Unlike virtual reality, which is much more immersive, augmented reality superimposes a computer-generated image on a user’s view of the real world to provide a composite perspective. Parker said students don special helmets and view simulations of materials known as coupons to practice their welding skills. Parker said it would greatly benefit both beginning and advanced students because they hone their hand-eye coordination and are better prepared to weld with real materials. For the latter group, it helps by providing a pipe simulation to aid their more intricate work. He continued that students practice between one and 1 ½ hours before they begin their normal schedule, but they must attain a minimum score within the 90 percentile on the classroom simulator before they can work on projects in the welding lab. The equipment is also useful for demonstrations during events such as eighth-grade visits and sophomore tours, plus students who have been absent can catch up on their schoolwork. BLOOMINGDALE-Jonathan Cortez is helping others heal as a registered nurse, and he prepared for his duties at the Jefferson County Joint Vocational School. In observance of Career and Technical Education Month during February, JVS alumni are sharing their experiences in their own words. CTE Month celebrates the value of CTE and the accomplishments of such programs across the country. Cortez, a Hopedale resident, graduated from Indian Creek High School and earned his degree from Trinity Health System School of Nursing, the latter of which is ranked second as the top Ohio nursing program and earned a 100-percent NCLEX-RN pass rate for 2017-18. In addition, Cortez is active on the Hopedale Village Council. He attended JCJVS from 2013-15 as a student in the health technologies program, graduating with honors from the National Technical Honor Society through the JVS’s local chapter. Cortez said the school helped him get a jumpstart on his career. Cortez added that JCJVS prepared him for the basics of healthcare, from infection control to Basic Life Support. He noted that he enjoyed his learning experience and could prepare for a career path right after graduation. “I’d like to think that I was able to shape my own foundation as to what I wanted to be when I graduated and went into the real world, plus they let us get a small taste of how the real world is set up. They gave us a trial run in what being an adult was like, but without the very harsh consequences of actually doing it. I can thank my government teacher at JVS, Casey Magyar, for teaching us how to balance a checkbook and writing a check,” Cortez continued, adding that it was a great place to learn. JCJVS currently offers 15 programs including auto collision, auto service, carpentry, computer networking, cosmetology, criminal justice, culinary arts, early childhood education, electrical trades, health technologies, multimedia and design, power mechanics, welding, transition to work and small animal sciences with HVAC to return in the fall. For more information, contact the school at (740) 264-5545. BLOOMINGDALE-For Jefferson County Joint Vocational School graduate Justin Dailey, his experience as a student helped shape his future. In observance of Career and Technical Education Month during February, JCJVS is highlighting graduates who have charted their own course by using the tools they gained at the Bloomingdale site. CTE Month celebrates the value of CTE and the achievements and accomplishments of such programs across the country. Dailey, of Wintersville, attended JCJVS from 2013-15 as a student in the welding program. The Indian Creek High School alum graduated in 2015 and credited the education he gained with instructors Roger Hilty and Todd Parker. Dailey has gained such accolades as first place in the Great Lakes District Council Apprentice Competition in Detroit, Mich., and was in the Top 30 during the International Apprentice Competition in Minnesota. He recently became an instructor for the local union and is currently working to become a certified welding inspector (CWI). He attributed his success to his education at JCJVS. “Mr. Hilty and Mr. Parker would go above and beyond to make sure that you are prepared to go out into the workforce,” he added. “I was able to obtain several certifications prior to my graduation that also helped me obtain employment. I believe that Mr. Hilty and Mr. Parker shared their passion of welding with you and made you excited to learn,” Dailey continued. “What I really liked about the JVS was that mostly everything was hands-on. I was able to read about it and then actually do it, and being hands-on helped me to become eager to learn as much as I could about welding. Automotive service technology students at Jefferson County Joint Vocational School learned some life-saving techniques after training with criminal justice instructor Jamie Freeman to obtain First Aid/CPR certification. Students watched a training video and worked with mannequins and Automated External Defibrillators as part of their lesson. Pictured are, from left, juniors Logan Charnock and Jacob Clark as they practice with their mannequins. BLOOMINGDALE-Three Jefferson County Joint Vocational School students represented Ohio SkillsUSA by attending a leadership institute in Washington, D.C.
Senior Michael Banovsky and juniors Allyson Burkett and Donte’ Grinstead traveled to the nation’s capital on Jan. 20-25 for the annual Ohio SkillsUSA Regional Officer Training Institute, where they joined about 40 representatives from around the state. While there, they took part in leadership training sessions, met legislative officials and toured Washington’s many landmarks and museums. Banovsky, a small animal science student at JVS, serves as a state SkillsUSA officer and made his return to the capital after first attending last year as a regional officer. This time, he worked with regional officers from around the state such as Burkett and Grinstead, who were recently elected to represent the organization’s southeast regional office. He was excited about the opportunity and said his participation in SkillsUSA has made a major difference in his life. Banovsky added that he was among a group who visited with U.S. Sen. Rob Portman’s (R-Ohio) legislative aide and shared how SkillsUSA impacted his life, in addition to the importance of Perkins funding for education. As a state officer, Banovsky also helped train regional officers to prepare for regional competitions, including the southeast regional event on Feb. 23. He said SkillsUSA has proven vital to bolstering his confidence and he was happy to take part. He said students who take a classified career tech class in high school or home school could also join. Burkett, a health technologies student, said it was a great learning experience and she also befriended many other officers from throughout Ohio. Her group went to SkillsUSA’s national headquarters and made stops at the Holocaust Museum, World War II Memorial, Arlington Cemetery and Lincoln Memorial, plus they met with legislative representatives and toured the Capitol Building. Grinstead, who participates in the automotive service technology program at JCJVS, said his experience has honed his leadership skills. “My leadership skills have been boosted through the roof and I can be much more professional in a professional environment,” he said, adding that he visited the Holocaust Museum, the Vietnam Memorial and other sites and he enjoyed going to Washington. The Ohio Association of SkillsUSA is a career-technical student organization serving students in high school and college post-secondary industrial, engineering and health career training programs statewide. SkillsUSA is a national organization that partners students, teachers and industry representatives to ensure America has a skilled workforce and prepares them for careers in technical, skilled and service occupations, including health occupations. BLOOMINGDALE- The Jefferson County Joint Vocational School Board of Education met to organize for 2019 and took action to operate the facility. Larry George, Barbara Cunningham and Randy Henry were re-appointed to the panel while George and Steve Bezak III remained in their respective posts as board president and vice president following elections. Officials then approved a variety of business from establishing the service fund to approving Superintendent Dr. Todd Phillipson as purchasing agent. During the subsequent regular meeting, the board was honored for School Board Recognition Month as Dr. Phillipson presented certificates from the Ohio School Board Association. Members also received JVS shirts and a meal catered by culinary arts students at the Crestview Inn Restaurant. The superintendent thanked the board for giving their time to improve educational opportunities for the students. Principal Dan Hartman then updated officials on testing and graduation news, as well as the upcoming Spotlight on Skills competition. Hartman said students were completing online testing and students have scored well on exams. He added that the state permitted two more years of options for graduation and officials were making sure students met requirements. “Spotlight on Skills is set for next Thursday. Our program teachers as well as academic teachers are working hard to make sure the students are prepared,” he continued, saying community representatives were also being sought to judge the various categories and top placers will move on to the regional SkillsUSA competition in February. --Discussed fire inspections completed in December by Johnson Controls and Warren Fire Equipment, Inc.